It turns out the Cucurbitae, or members of the squash/marrow/pumpkin family, make great friends with seafood, particularly prawns. In many cases, like butternut squash or pumpkins, the flesh is naturally sweet and colourful, and has a tendency to collapse under cooking, giving great texture. The flavours match the prawn’s own sweetness. 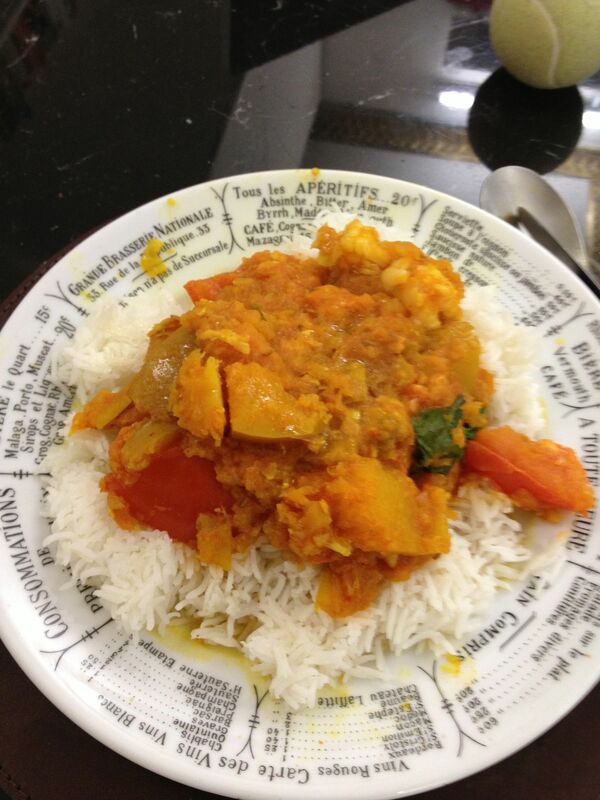 I use a mix of prawns and white fish (cod, hake, cod cheeks, etc.) for variety and not have an over-rich dish. Start by marinating the prawns, shells, antennae, alimentary canal and legs removed, but with the heads retained (being careful to not lose any of the red stuff). I use ½ tsp of turmeric, 1/8 tsp of crushed cumin seeds, and a crushed/grated mix of ¼ small onion, 1cm ginger, 1-2 garlic cloves, a bit of salt, a bit of lemon juice. This is for 2-4 prawns, and about 200g of white fish. I tend to use less spice/alliums to not overpower the prawns sweetness, so feel free to experiment. Chop up the squash into 5cm square chunks, and if using the skin (which I do), pressure cook briefly until the skin is soft. Chop up rest of the onion, and soften on moderate heat with 1-2 dried chili, 1cm grated ginger, 1 clove sliced garlic (add garlic last to avoid burning). 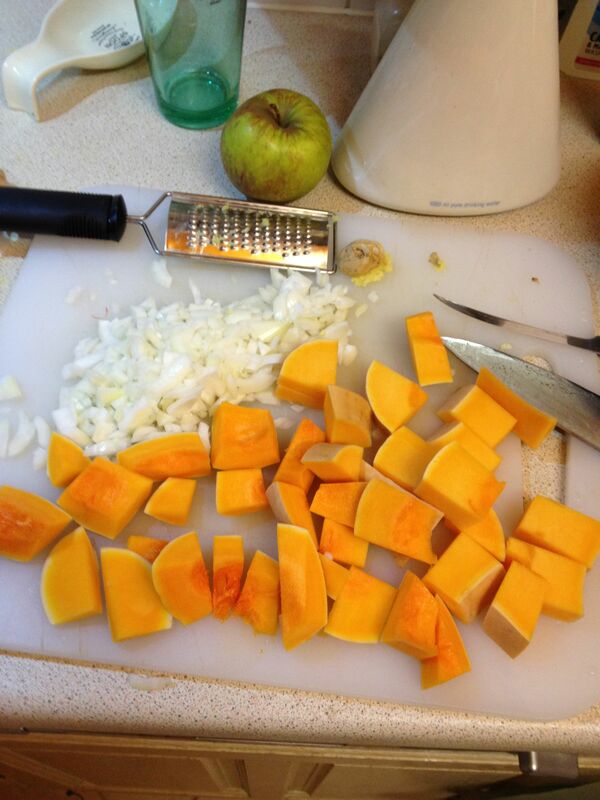 When onions are soft, drop in the squash, and crush a bit. Add a little water. Once that has mixed nicely, I put in the white fish (not the prawns) and as much of the marinade as I can scoop up and let that cook. 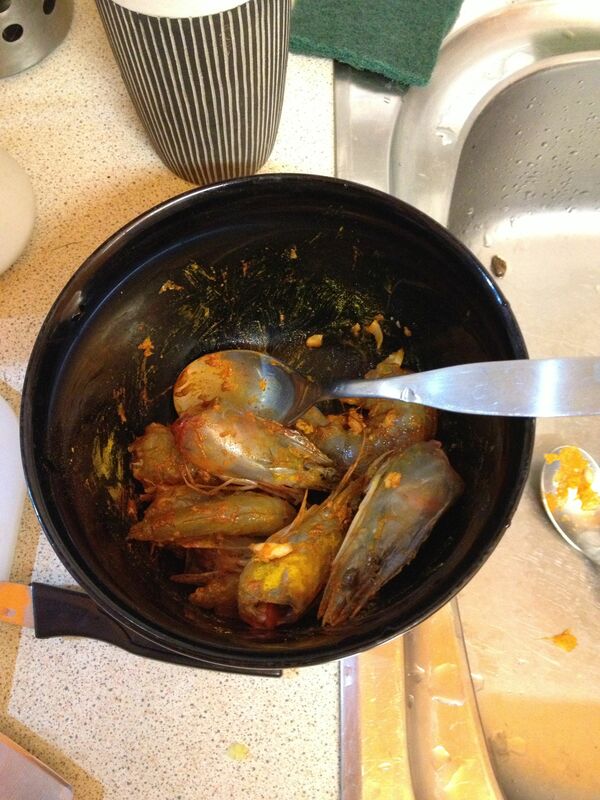 After 1 minute, drop in the prawn heads and crush to flavour the sauce. Don’t worry if the white fish breaks up, it should form a melange with the bits of squash. Taste the sauce – check for sweetness balanced by salt and sour. It might be light on the sour, so I add either a little chopped tomato or (real tomatoes being out of season and the Dutch mutants we get woeful) a bit (capful) of white wine or sherry vinegar and let the “vinegariness” burn off. When the fish is mostly done, drop in the prawn bodies, and cook – do not overcook. Take off heat, and throw in a little chopped coriander, and chopped green chilis. Wine: I drank it with a (nice, from 259 Hackney Road) beaujolais nouveau. I find the gamay grape to work surprisingly well with spicy food. A more conventional red choice (if such exists) would be pinot noir. Safest is a riesling.